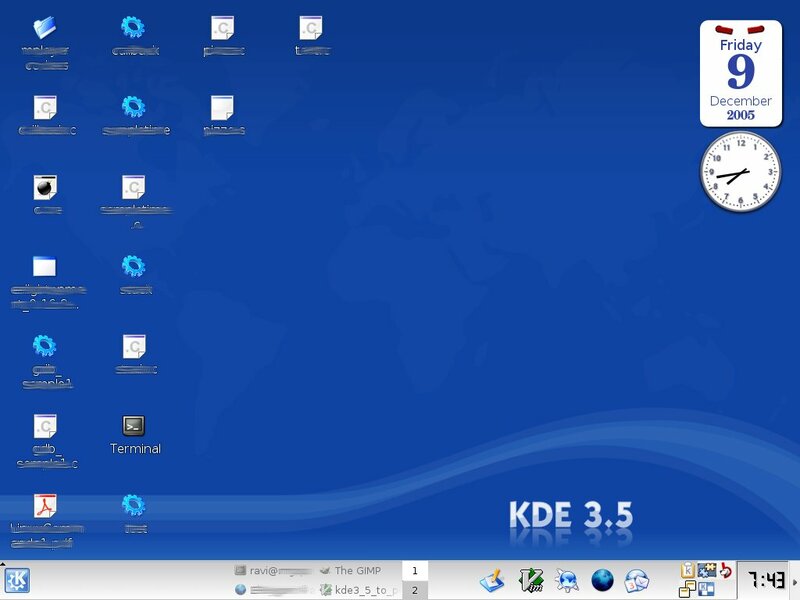 Recently, the KDE team released the latest stable version of their flagship product KDE desktop for Linux and other Unices. And within a short time, the good samaritans at Ubuntu (or should I say Kubuntu) made available the packages for KDE 3.5 in their repository with the instructions on how to upgrade all the packages on your machine to mirror those of KDE 3.5 provided you were using Breezy Badger v5.10. Add the digitally signed key to your machine. Include the kubuntu repository in your /etc/apt/sources.list . Over 130 MB of packages were downloaded from the repository after which the whole system was upgraded to use KDE 3.5. KDE 3.5 has many marked improvements over its older sibling (3.4). Some of it like storage media notification for the user to realise and many of it under the hood. 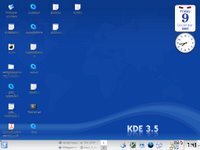 Jure Repinc has written a wonderful review of the improvements that one can find in the new KDE 3.5 . His review is an ongoing series of which part 1 and part 2 has been released. Reading the review gives a user a good idea of what to expect from the new version of this ever popular desktop. But this is just the beginning. KDE 4.0 the next major release is expected to be even more fantastic with respect to usability and eye candy. And we can wait with our fingers crossed till the release of KDE 4.0 next year. I do like KDE, it is simple and versatile BUT it is not working well with Kubuntu Brezzy so far... many bugs with the "System Setting" display, it seems a resize problem (Missing buttons and incomplete menus; Admin button is missing in some options), Kgmailcheck doenst login properly... as far as i read in the forums it seems a bug with the new logging system using by gmail. Kmess (Messenger clone) is the same history as Kgmailcheck (doesnt login). If you are tinking about downgrade of KDE3.4 your usb drives will not mount properly. So i am still looking for the next kubuntu release with all these bugs fixed... so sad i have to go back to ubuntu with its messy Gnome menus distribution and its pitty separate task bar... but it works perfectly :( (if you are thinking about openSuse there is more bugs with APM and laptops).